... or one of many other recumbent bikes. The Ligfietsgarage (Recumbent Garage) in Groningen, where I work three days a week, is having a test ride day on Saturday the 31st of October between 11:00 and 16:00. 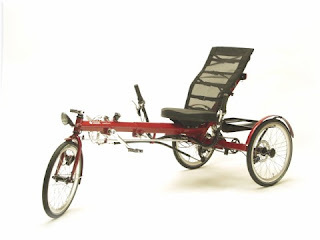 The full range of Sinner recumbent bikes will be ridable as well as models from other manufacturers that we stock. The event is free. You don't need to register in advance, but you will need to show ID before borrowing a bike. Staff as the shop speak fluent English and German as well as Dutch. As well as many new bikes, we stock second hand bikes and supply parts and servicing for recumbent cyclists. Click through for the Sinner website. Margaret from California sent me this video of her commute. I think it's telling that while she's on the roads there are no other cyclists, but as soon as she's on the pleasant path on the beach there are other cyclists. After the end of the pleasant path, there are again almost no cyclists in the video. It's a good illustration of the ability of good quality cycling infrastructure to encourage cycling. It comes down to subjective safety. If people feel that cycling is safe, they will do it. I discussed something similar in the context of the UK last year: If you build it, they will come. Recreational cycle paths are very nice, but really good cycle facilities which provide convenience and safety lead directly to a higher cycling rate. The pleasant bike path in the first video is "The Strand" bicycle path. Some new cycle paths are being planned in Cambridge. Good news, you might think. I took a look. Amongst them are a path from Milton to Impington which ought to provide a good route for school children. It's about 1.2 miles or 2 km. A very small distance by the standards of how far Dutch children routinely cycle to secondary school. I first knew about this as a result of the Cambridge paper being in uproar about how the improved path might mean the end of the school bus by which children currently make this journey. Back when we lived there, I found that a lot of parents were quite against there being an improved cycle route in this direction specifically because they feared the end of the school bus. Who needs a bus to travel such a short distance ? When you read the plans on the council's website you discover that the parents fears are at least in part justified. What is being proposed is not nearly good enough. It's to be merely a 2.5 m wide path shared by pedestrians and cyclists travelling in both directions, and separated from a road with a 100 km/h (60 mph) speed limit by just half a metre. That's an inadequate gap to provide subjective safety with motor vehicles travelling at such speed so close by. What's more, the proposed path doesn't actually reach the obvious destination, Impington Village College, which is another half a mile into Impington, around a few blind corners on the road. I had a couple of scary incidents myself in that location, with drivers coming in the opposite direction driving too fast on the wrong side of the road around corners. Is this going to be a popular route for people to send their children on ? For a bit of perspective, our local standards (Assen now, not Cambridge) call for 2.5 m in each direction for cyclists + additional space for pedestrians, a 2.5 m gap between the path and the road, and that our local speed limits on similar country roads are 60 km/h (37 mph). It is quite normal for children here to cycle 20 km in each direction to get to their choice of secondary school and they can always do so in safe conditions. In fact, I made a video to illustrate a school run from a village into the city. The bridge in the photo is at one end of the proposed Milton - Impington path. I'm still waiting to hear what they will do about this existing pedestrian only bridge over the A10 which is on the proposed route. The photo above was taken back in 2005 when we still lived in Cambridge. The bridge was already falling apart. Nice weekend video. The Netherlands by bike in the 1950s. Mark Wagenbuur has made a wonderful video combining views of cycling in the Netherlands in the 1950s. The remarkable thing about it is how familiar all of it looks. There's exactly the same level of cycle helmet wearing as in the country now, roughly the same number of people riding on back carriers, children on bikes, "ordinary clothes", practical bikes and smiling faces. 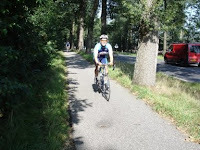 More specifically, compare the scene at 1:15 with part of a video I made of the fietsvierdaagse last year. 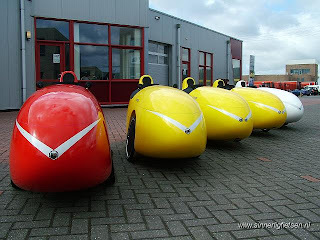 Even the four wheel "family sized" velomobile at 1:40 has a modern day analogue in the Netherlands. And that bloemencorso at the end... We went (by bike of course) to one this year, but I've not put it on the blog yet. Another video from the 1950s that I like a lot is this one. Sadly, though, Britain does look as it used to. These three photos come from a city in Canada. The same one I featured previously. They show a new cycle facility to create a link for cyclists. Cyclists have been squashed between the existing sidewalk and a fence. Things such as seats at a bus stop are right on the "cycle path". At this point the unfortunate cyclist is put into just about the worst possible point at the entrance to a property. Unfortunately there was "no room" for a wide cycle path alongside this four lane road. Of course, if you were to measure the width of the road you would soon come to the conclusion that there was plenty of room if it was possible to re-allocate just some of the space given over to motorised traffic. The junction here is at the end of this cycle path. After bunny jumping the seat, cyclists are left to work out what to do next. It is unfortunately extremely common for many countries to produce infrastructure like this. It doesn't work to increase cycling levels by a significant extent because it's very obviously second rate. Cyclists need directness, safety and to have a pleasant journey. They don't need an obstacle course. I previously covered this "too narrow" claim with an example in Cambridge. The latest news from our local government contained this piece. Last Thursday they voted to give an extra €975000 for cycling with the aim of further increasing the level of cycling. A road which still has a tiled cycle path from a couple of decades ago is to move over to smooth asphalt, and another rougher path is to be surfaced better too. There is another €200000 for recreational cycle paths around the city, and as a stimulous to the economy, a cycle path is to be built sooner than was planned along one of the roads outside the city (one of the roads we covered on Sunday's ride). Also €145000 is reserved for safety improvements especially on school routes and around schools and there is to be yet more cycle parking at the train station and at bus stops. There is also to be extra guarded cycle parking at events. I'd missed this story, but Judy pointed it out to me and so did my local correspondent, Frits, who also said, "Cycling facilities are cheap". He went on to say that this is "Quite a bit cheaper than other roads, and far more effective." Quite right too. Note that Assen's population is just 65000, so this is an extra 15 euros per person in the city. To get an idea of how significant this is, scale it to the size of your city. e.g. for London with its 8 M population, you'd need the council to decide in one of its meetings to allocate about an extra 110 million pounds. It may sound a lot, but how much are they spending on roads for cars ? Mark Wagenbuur has been busy making videos of different routes into the city of Utrecht. They were built at different dates but they link together as a whole. This is why cycling is convenient in the Netherlands. Watch each of the routes (by playing the video above and clicking on each of the boxes in turn) and you'll see true "cycling superhighways" without the hype involved in naming them in that way. There has been much hype about "superhighways" in London, and given what's being promised it really doesn't live up to the way its being described. Much has been made in London recently about how there will soon be "superhighways" for cycling, though what they seem to think a "superhighway" is would seem to be a bit limited. Copenhagen is also considering doing such things, and at least they are actually trying to achieve a cycling rate similar to that of Dutch cities. Over here in the Netherlands, direct and convenient cycle paths have existed for a long time. However, the Dutch are not given to exaggeration, and such things are simply called cycle paths. Note how infrequently cyclists have to stop. Traffic lights are timed to be green on arrival for cyclists, side roads give way to the cycle path etc. This is merely a taster of one of the routes. To see all of the routes videod, go to this blog post. There are more examples of cycle paths making cyclists journeys convenient. Along with addressing safety, it's one of the things that is essential to encourage a high level of cycling. This excellent video from Utrecht is from Mark Wagenbuur. There are several other posts about cycling "superhighways". I went along for the huneliggers ride this morning. The others at the start place were returning to Groningen by a fairly short route, so Peter and I rode back to Assen together in our Mangos. It's been getting colder. When I rode to work this week it was -3 C at the beginning. However, this morning it was 2 degrees above freezing, and the sun was shining nicely. Very pleasant, especially in a velomobile so the cold air is kept off you. I've lots more posts (and videos) of the huneliggers in action. The Biomotion tour came to Assen yesterday. Yesterday's event was at the TT circuit, and today we were in the city centre. There were many alternative fuel cars, but to me other things were more interesting. There were a few electric vehicles of one type or another, but I don't need to write about those. Large car companies are quite capable of dealing with their own publicity (however there are details at the organiser's website). There were also a few small electric vehicles of one type or another and ours were the only purely human powered vehicles. We took along a selection of Sinner recumbents. Our new black demo Mango attracted a lot of looks. It was a novelty to get to ride on the famous TT track. Someone there told me he'd ridden a bike around it before and found it hard going, and he was right. The surface does seem a little odd. Presumably it's designed for maximum grip for motorbikes cornering rather quickly. Also, the total lack of protection from sidewinds made corners quite "interesting" even at my speed. The last time I was there was during the prologue of the Vuelta, but we were sitting in those seats that time around, not on the track. The vehicles next to my Mango are Drymer electric assisted tricycles. It's a leaning tricycle with optional cover. Really quite good. This vehicle isn't human powered at all, but I liked it. It's a local school's entry in the Shell eco-marathon. 270 km on one litre of petrol is pretty good. I wish I'd had the opportunity to get involved with something like this when I was at school. In other news, I've now had my Mango for one week and one day. It has 311 km on the clock. The total would have been higher, but yesterday it covered only the distance to the TT track and back, and today just the 4 km round trip to the city centre. In discussions about the rate of cycling in different countries, people often make remarks along the lines that "the Dutch cycle because the Netherlands is flat". It's just an excuse, of course. They're either trying to excuse the low cycling rate of their country or sometimes it's an attempt to disregard the effect of the infrastructure which the Netherlands has used to achieve its high cycling rate. I think this is a much overemphasized difference between the Netherlands and other places. Many settled areas in many countries are also flat, or nearly flat. They don't all have a high cycling rate. An example which I've used on this blog is Lincolnshire in the UK. The area has many residents descended from Dutch immigrants who drained the low and flat landscape, despite being so much like the Netherlands, Lincolnshire consistently does the wrong things to encourage cycling and there is very little cycling there. 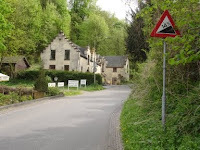 What's more, the Southern Dutch province of Limburg is actually rather hilly. 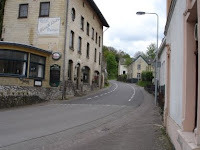 Limburg hosts the Amstel Gold Cycle Race which is known for its particularly vicious hills. The capital of the province is Maastricht. I covered Maastricht a few weeks back. They already have a cycling rate of around 30% of journeys, higher than anywhere outside the Netherlands, and are working hard to increase this. Putting aside demographics, the only thing which seems directly related to cycling rate is the quality of infrastructure. The Netherlands spends more per head than any other country on cycling infrastructure, Dutch infrastructure is the best in the world for cycling and this country has the highest rate of cycling as a result. Second place is taken by Denmark, where they don't spend enough and have a declining cycling modal share. Germany spends less again, and has significantly worse infrastructure, but is stable with around a third as much cycling as in the Netherlands. It's quite easy to see why if you move between the borders of these countries. It's simply more pleasant here to cycle here and this is why people do it. Make cycling convenient, safe and pleasant and people will cycle. See also coverage of Trondheim - a city which has huge hills, very challenging winter weather, but which is growing cycling from an already high base by building infrastructure. 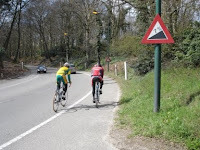 For people who really like cycling up hills, there is an organisation here in the Netherlands which provides information about where to find nice steep hills to ride up. 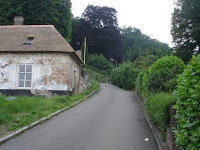 The photos of hills here in the Netherlands come from their website. this looks quite a challenge. Another example is Switzerland, which has a cycling rate which is above any English speaking country. Switzerland is definitely not flat. Previously I've covered how the policies followed by the government in Groningen led to the city having the highest cycling rate in the world. I don't understand why the film ends with turning into the bus station, but it's an interesting counterpoint to the first part of the first video. If the filmer had waited, a couple of hundred metres further along is the railway station with it's marvellous cycle parking. Which one does your city most resemble ? Old fashioned Groningen or modern day Groningen ? I went racing again today, and a lot of fun it was too. The thing is, I have a new bike. With very much help (thanks once again) from my colleagues at Sinner, my Mango was finished at 10 pm on Friday night, which is when I rode it home. This makes my Mango, the 202nd, the newest in the world at the moment (but not for long as we're making more next week). Today's race was in Groningen. When I raced there last year on the PDQ, I averaged 34.2 km/h. With the Mango today on the same track for the same length of race, my average was 40.9 km/h. That's nearly a 20% improvement. In order to have pushed the PDQ to the same speed I'd have to produce 60% more energy, which would be impossible. The Mango's aerodynamics make that large a difference. It rained for the trip to Groningen and back (but not during the race) and of course the rain cover kept the rain off me. It's 30 km between here and Groningen, and I was very glad to be out of the rain for that journey. Earlier in the year, I was a little faster riding a borrowed Mango, but we'd fitted faster tyres which were slightly worn at the time of the race, which helps them roll a bit better. My Mango is perhaps a bit too new at the moment for maximum performance. It's still only done a little over 160 km in total. And next week ? I'll be commuting in the Mango, rain or no rain. I found with the borrowed test Mango that it takes 20 minutes per day off my 60 km round trip commute. Peter Haan riding his Mango with racing hood. He says it gives him about 10% more speed at 40km/h and above, which isn't quite enough to explain why he's so much quicker than me. Harry Lieben and Marjon van de Kraats with their back to back tandem. Ymte Sijbrandij, standing on the left, won the race with an average speed of 53 km/h, and Wilfred Ketelaar who has his own Mango on order after taking a test ride. Russell waits for Jolanda to finish racing. You can find more posts on this blog about the Sinner Mango or take a look at the manufacturer's website. The next year, I went back again. There are more photos of the event here and a short video here. Read my review of the Sinner Mango Velomobile written two years later. These photos were taken near work a few days back. The sign says "Through-going cycle traffic to the left cut off. Follow(2)". The numbering system means that more than one redirection is possible at any one time. Keep following in the direction of the signs and of course you get directed back to where you would have been if road works had not interrupted the cycle route. As covered previously, cycle routes are generally not cut off when road works take place as it's important to maintain cycling. However, this can't always be the case, and this is the alternative. Follow these signs to find the alternative route. There are several other stories about road works and how they affect cyclists. 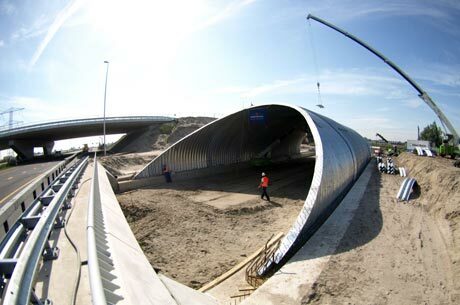 In the west of the Netherlands the A12 motorway is being rebuilt. Part of the rebuild will require a cycle tunnel under the motorway. The Fietskathedraal is being built to ensure a pleasant route for cyclists. It's to be an underpass which is 53 metres long, 16 metres wide and 6.5 metres high - roomy and as a result with a good degree of social safety. One of the unusual things being done to make the tunnel as attractive as possible to cyclists is an unusual method of lighting. Blue LED lighting will be used to make the tunnel the tunnel look even more roomy. 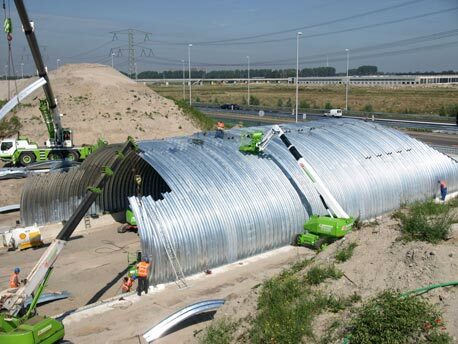 The Fietskathedraal is to be one of the largest corrugated steel constructions in Europe. The cycle route is to be open by around the end of this year followed by the road in October next year. This is far from the cheapest option, but who said that maintaining and growing the world's highest cycling rate was cheap ? 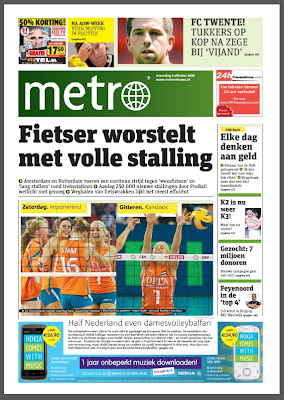 Front page headline news in today's "Metro" - a free national newspaper available at the train station. "Cyclists struggle with full cycle parking". The article, continued on page three with a headline "Where did you leave your bike?" 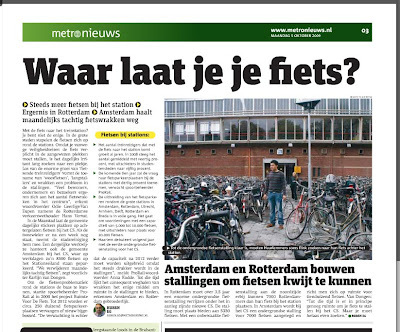 is about the continuing crisis in railway station cycle parking in the Netherlands. The newspaper reports on how due to the growth in cycling, cyclists taking their bikes to railway stations have a growing problem of finding somewhere to park. Rotterdam is building a new underground cycle park for over 5000 bikes, Amsterdam is building a new one for 7000 bikes. The number of people arriving at the railway stations by bike rose on average by 40% in 2008 and in university cities the rise was around 50%. The railway company is predicting another rise of 30% in the next ten years. Overall, an additional 100000 cycle parking spaces are to be built at railway stations across the country, and another 150000 existing places are to be renewed. That's enough new and renewed spaces for one in 64 of the population of the entire country. The newspaper is asking quite seriously whether this is enough. The Netherlands has just 16M people. For the USA (for instance) to achieve the same thing, they would have to build 4.6 M cycle parking spaces at railway stations. "Going by bike to the station ? You're not the only one..."
The Netherlands has a higher cycling rate than any other country and there are cities here with higher cycling rates than any cities elsewhere. This is why so much cycle parking is needed. Dutch cyclist counts don't even include those people who are cycling to the railway station or bus stop. They're counted only as public transport users. There are other posts about integrated transport or specifically about cycle parking. The high cycling rate is the result of policies to increase the directness and safety of cycling. Meanwhile, there are efforts to get cycling combined with public transport higher up the agenda. The local council has a fleet of cargo carrying bicycles which are used by people doing work such as keeping the beaches and other areas of the city clean. They're painted with just the same colour-scheme as the vans, and the same scheme as the council's normal bikes. Typically for a job requiring a few workers these bakfietsen are outnumbered by the "normal" council bikes. And underneath, here's another one in the city centre (with a standard council bike on the left and a "civilian" bakfiets in the background). 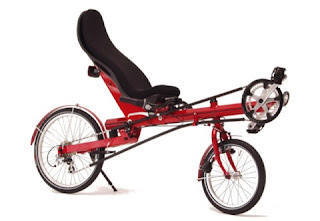 Next week we have cycling holiday customers who asked for recumbent bikes to ride. They were delivered today so Judy and I took them for a test ride around Assen. Suzanne in Utrecht subscribed to my youtube videos and as a result I saw this video she'd made of her commute in Utrecht to the Fietsersbond office (Fietsersbond is the Cyclists Union of the Netherlands - a campaigning organisation). Very nice. A typical commute, mostly away from motorized traffic, but in this case interrupted by building work. Note how the van driver reverses out of the way. Two friends from Cambridge, Simon Nuttall and Martin Lucas-Smith, have been busy for several years working on Cyclestreets, an international online map for cyclists which allows positioning of photos on the map as well as route planning. Simon is now up for an award as a "digital hero" which could result in extra funding for this valuable resource, providing he gets enough votes. 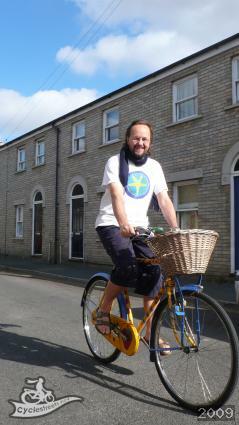 Details of the award, and how to vote, are on the Cyclestreets blog. The Photomap now has over 17000 photos on it from all around the world. I've uploaded over 500 myself, from all corners of the UK as well as here in Assen. Any project like this only gets better as people use it. Please upload photos from where you live and help with the route planning for your area.